Your kitchen is a main staple of your home. As such, you want it to be functional and stylish all rolled into one amazing package. If you are interested in remodeling your kitchen, you are in the right place. Our team of professionals at Timco Construction can handle whatever it is that you are looking to have done around your kitchen. We have an assortment of different products and services available to help facilitate your kitchen remodel and provide you with the space that you desire. If you want to redo your cabinets or just add in additional cabinetry in your kitchen, we offer two different cabinet lines to accommodate your needs. Our first line of cabinets is Waypoint. They are made from high-quality materials and pre-finished to provide you with a look that wows. Choose from soft close drawers to raised panel doors. The possibilities are endless with Waypoint. We also offer Alliant cabinets. They tend to be more cost-effective and are often found in businesses and multi-family housing. You need quality countertops to prepare all of your meals or lay out your food spread for a large gathering. 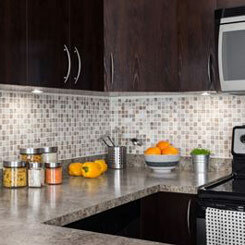 We have tile, quartz, granite, Corian and countless other types of countertops available. Our team is also experienced in laying ceramic tile, such as creating a beautiful backsplash or laying new flooring. Choose from any number of different patterns to accommodate your individual style and taste. Regardless of what it is that you are looking to have done, you can trust in our team to come in and provide you with the quality craftsmanship you deserve. Your satisfaction is guaranteed when you trust in our team at Timco Construction. A bathroom should be a place where you can go and unwind after a stressful day at work. You should be able to sit back and enjoy a nice, hot bath in your large garden tub. 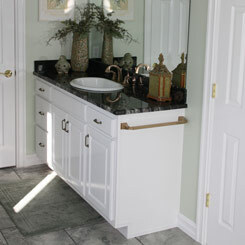 If you want to transform your bathroom and create your own oasis of sorts, you are in the right place. At Timco Construction, we can take your existing bathroom and completely remodel it to give it the style and charm that you want. Whether you want a new shower or you want a bathtub and shower combination, we can handle whatever it is that you want. Our team can not only install the new shower, but we can also install ceramic tile around the enclosure to provide you with the sensational look that you desire. Whether you want an ocean-themed bathroom with hints of blue, white and green or you want something neutral in shades of tan and white, we will customize your space according to how you want it to look. With our bathroom remodel services, we can also install new vanities to give you an extra sink, additional cabinets for extra storage, an oversized tub and much more. We can also repaint the walls to make them a more neutral shade that is going to tie the whole look together and leave you with a bathroom that you will love spending time in. Whether you are looking to remodel your home or business, our team at Timco Construction can handle it all. It doesn’t matter if you want to add on a garage, spare bedroom or game room because we have a team of professionals who are capable of handling everything you need. If you are simply looking to remodel your existing space, we can handle that as well. We can also convert one of your existing spaces and transform it into the space you want. Convert your attic into another bedroom. Transform your basement from a storage space into a large game room or family room. Your space can become the extra square footage you need to accommodate your growing family or company coming to stay with you. Our remodeling services cover everything from flooring to cabinetry, painting and beyond. We can take your existing business from a small 700-square-foot space to double the size. The only limitations are what you want us to create for you. No job is too big or too small when it comes to remodeling your home or business. Many people opt to renovate their existing space to help boost the value of the home and make it more aesthetically appealing. If your home needs a little TLC and you need someone who can come in and get the job done in your timeframe, Timco Construction is the one you want to turn to for your renovation needs. It doesn’t matter if you need your existing windows or doors repaired or replaced because we can handle either job for you. When your windows are in good working order, it can keep drafts to a minimum and prevent you from spending more on your energy bill than you need to. A new door will help enhance curb appeal. To help boost the value of your home even further, consider repairing or replacing the siding on your home. Not only does it make your home look nice, but it can completely transform the look of your home. We can also help further enhance the inside of your home with new light fixtures, molding, and trim. Whatever it is that you want to do in your home, you can trust in our team at Timco Construction to come in and get it done for you. All of the work we do is up to code, so you never have to worry about anyone cutting corners or attempting to do sub-par work. We take pride in being able to deliver exceptional work each and every time. Whether you need sheetrock repaired or you want someone to paint the inside of your home, our team can take care of all your renovation needs.